Why a web series after movies and teleserials? I signed on The Test Case because I really loved the script. The story has given me the opportunity of playing an army officer. When I heard the script – the way it was presented to me – frankly it was a no-brainer that I would do it. I did not have to think twice. You cannot compare Homeland – or what I did in it – to anything that is happening in the world of web series, especially in India. Homeland is an established and celebrated show and it is in a completely different league altogether – even when you compare it to other international projects. In India, as far as web series are concerned, they are in a nascent stage and we are still finding our footing. 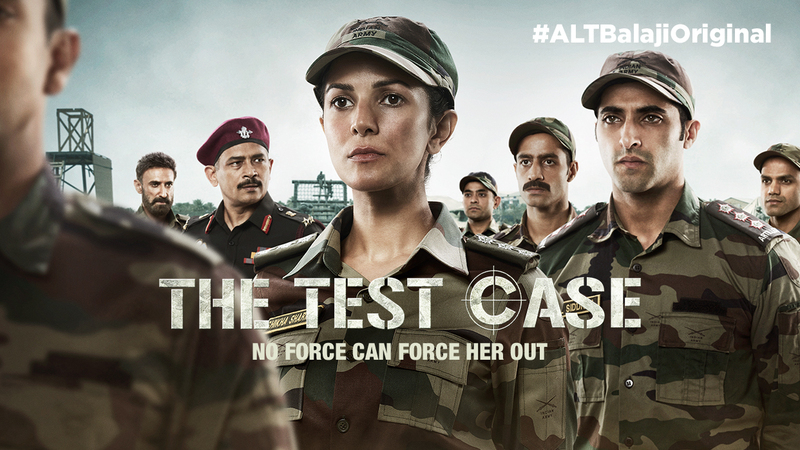 But The Test Case is not being treated with any lesser intention just because it is a web series. There is no compromise on quality – in the way the content and execution are being treated. And we are happy with what we have achieved in the first episode. In The Lunchbox, there was a great deal of emotion. Here, does action take over? It is true that The Lunchbox was heavy on its emotional content. But, what you have seen in the last few days is just the first of the 12 episodes that have been planned for now. It is going to be a long journey. The first episode literally provides a peek into the world of Captain Shikha Sharma – it establishes what we want to show about her background. Action is going to be a part of her graph on screen because she is a commando, but there will be a lot of emotion too. The plot and character development will have many layers. What was the kind of preparation that you had to undergo for the role? You can say it is still a work in progress. But the preparation was the toughest thing that I have done in my life. It has taken me months of athletic, rigorous, endurance training to get ready for the part. I have had to give up almost everything that I love to eat. But, all the effort has been very rewarding – and physically I have never been more in tune with my body. Would you say our country still needs such test cases? Unfortunately, it is a tough world for women anywhere, in any profession – and not just the forces. Needless to say that it is a male-dominated world. Even in present times, in India we cannot fool ourselves that women have equal rights – the reality is a far cry from that. The level of discrimination and unfair attitudes get worse when you go into smaller towns and villages. How would you as an individual deal with any discrimination that you might face? I would say that it depends on how much importance I would give it. Personally, I am averse to the idea that being a woman is more relevant than how good you are at your job. As a person, you cannot make your gender a crutch to get ahead in life. So, if someone treats you badly, undoubtedly there is a problem. But I feel it all depends on you how you turn the situation around. Any one character you have assayed whom you would say you are closest to, temperamentally? Temperamentally, I would say Shikha. I am closest to her and relate to her the most. She does her own thing without caring who says what about her or her actions. How do you deal with things when the going gets tough? When faced with challenges, I tell myself that it can always get worse. When things go south, I just take a deep breath and work hard to pull myself out of the situation. Having talented co-stars is creatively exciting. It is like playing a tennis match against a tough opponent – you do not know where he is going to hit the ball. But, it is challenging to share space with people you respect! The setting in the first episode was real (evoking memories of Lakshya) with the characters playing their parts well. Atul Kulkarni and Rahul Dev – as the in-charge officers – look and act their macho parts with just the right degree of conviction. Kaur too takes things in her stride, without indulging in any melodrama. One hopes that the Nagesh Kukunoor-directed series does not get too emotional or overplay the girl-versus-boy debate that has plagued our society for ages. 4 Powerful Indian Ads That Will Make You Think!